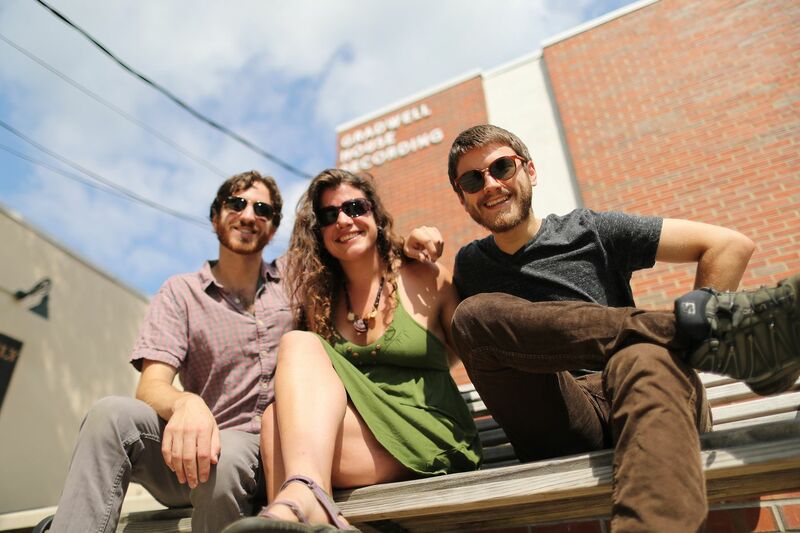 Jeremy Savo, 27, Ethan Feinstein, 25 and Robyn Mello, 31, (L-R) are among the musicians, artists and educators behind 'Beardfest,' the innovative festival of music, 'live art' and workshops that kicks off June 14 outside Hammonton, NJ. Beardfest has almost nothing to do with beards. "It's a joyous celebration," explained Robyn Mello. "A collaboration," Ethan Feinstein said. "It's about building community," said Jeremy Savo. Added Bri Barton: "Beardfest is a beautiful hot mess." What began in 2012 as a little backyard bash in Waterford for 100 friends of the band Out of the Beardspace (hence the "beard" in the title) has evolved into a kid-friendly music and arts festival, a savvy South Jersey mashup of Bonnaroo, Burning Man, and Woodstock, minus the media, the celebrities and the excesses. About 1,300 people attended last year; Beardfest 2018 starts at 5 p.m. Thursday and runs through Saturday at the Paradise Lakes Campground near Hammonton. Tickets are being sold online and at the gate. Headlined by its namesake band as well as luminaries Modeski, Martin and Mononeon, the performance schedule offers an eclectic lineup of 30 bands — and genres such as funk, jazz, jam, salsa, rock and more — as well as participatory "live art" and workshops. Much of the educational programming has environmental and social justice themes, although festival-goers also may choose basket weaving, herbalism, yoga, self-defense, or "unlocking your stage presence." Drum circles? Yoga? Dancing in the moonlight? "I'm inspired by the idea of Beardfest as a university, where there can be an exchange" of knowledge, ideas and creative energy, said Savo, 27, a guitarist who hails from Cherry Hill and lives in Clementon. Savo, Barton, Mello, and Feinstein are key members of the idealistic group of young musicians, artists, environmentalists and friends who have collectively nurtured the festival's steady growth while keeping its local character. That, and the deep connections among the four and their associates, have helped keep Beardfest real. "It's grown organically, year by year, a kind of an expanding friends circle effect," Savo said. "And as our status has risen, established people in the music business want to work with us." Pals since boyhood, he and Feinstein, a 24-year-old drummer, both work as private music teachers. Mello, 31, grew up in Stratford and did urban agriculture work in Philly neighborhoods for years; she also has what she describes as a "life project" called edenspore, which involves music and green advocacy. Mello lives in Clementon, as does Barton, 29, an illustrator who performs with ROMPUS, a painting troupe that grew out of Beardfest. Their performances unfold on a raised onstage platform and have become a festival signature. "In 2013 we just decided to stretch some fabric between two giant easels," Barton said, telling the ROMPUS origin story. "We lit it from behind and just started throwing paint. "The audience sees people's silhouettes and watches a painting emerge. The light gives it sort of a stained-glass effect. It's really entrancing." It's no small feat to produce three days of live entertainment and other activities in the middle of the woods. The core group of about 20 people is augmented by about 60 or so volunteers, as well as security and medical staff. The members of the production team share a vision of the festival as not merely entertaining, but as educational and (potentially) transformational. And they regard its birthplace, South Jersey, as a creative wellspring and as a place far more distinctive and interesting than some people seem to think. "It has a lot of microcosms, a little bit of everything," Epstein said. "There's a really rich culture in South Jersey, being so close to Philadelphia and New York. Our backyard literally touches the Pine Barrens, the ocean is practically on our doorstep, and to be connected to all that at once is a feeling I also get from Beardfest." Yoga in the Pinelands with live musical accompaniment? Yup. It's 'Beardfest,' South Jersey's homegrown festival of music and creative expression. "We love the Pine Barrens so much," Mello said. "The unique ecological system we're surrounded by kind of leaks into the art, the music — everything." I interviewed Mello and other organizers at Gradwell House Recording, a Haddon Heights studio that's a Beardfest sponsor as well as a gathering place for musicians and others in South Jersey's creative community. The community's support helped Beardfest pull through an early crisis — and set a standard for the sort of collaborative, participatory, let's put on a show vibe that has come to define the festival. 'Live art:" Painters behind a scrime create as musicians make music onstage at Beardfest, South Jersey's homegrown festival. On the eve of Beardfest in 2014, permission to use a privately owned site was withdrawn. The next morning, organizers learned about the availability of Paradise Lakes, which had been unused for several years. "Everyone, including people we just met, picked up the whole festival and moved it," Feinstein recalled. "It was amazing. Every single person who came realized it was up to them to help make it happen. We literally couldn't have done it without them. And it helped create the bond people have come to expect from Beardfest." He and other organizers talk about Beardfest as a way to help make the world a better place. And as a boomer, I can't help but wonder if we haven't heard this sort of thing — delightful as it is — before. Like, say, during the late 1960s? But the hands-on idealism of Beardfest, and its focus on building a community in ways that go beyond a shared love of music, strikes me as very much a 2018 thing.